Did you know that one of the long-time collaborators of Trent Reznor of Nine Inch Nails is an Italian keyboardist, and also a pretty good one…? I recently found out, so I made some investigation about this. Alessandro Cortini, born in Bergamo in ’76, migrated to the US to pursue a career in music. Starting out on guitar at music school, he later developed an interst in synthesizers, modulators moogs, and synth music of the latest generation. He went on to master the genre, and was basically ‘hired’ by Trent Reznor to become an essential supporting member of Nine Inch Nails, from 2004 onwards. Alessandro then helped to streamline the new sound of the band, making it even more experimental and excessive. Known for their accurate studio recordings, Alessandro has been one of the key musician able to live-play most of NIN synthetic parts. This week I checked out some of Alessandro’s solo work, published under the pseudonym of SONOIO (“That’s me”), with two official relases + various other bands and side projects. Though not being a super fan of electronic music in general, I must say this have been a good soundtrack for me to start this grey December. Enjoy the video attached, and I hope you will feel like discovering more on this gifted artist. I always got a special fascination with gloomy, poorly recorded and worn out albums, especially those put out by big rock’n roll stars in cryptic moments of their career. In 1982, Bruce Springsteen, “the Boss” of American rock, was at the apex of his career. “Born to Run”, published with the E-Street band in 1975, projected him to solid stardom, followed by other smashing successes until the acclaim of “The River” (1980). When everyone’s eyes were on Springsteen’s next move, the boss basically locked himself in his room and recorded a demo of plain acoustic songs on a cassette tape recorder. After attempts on re-recording this act with a louder rock formula through a rock band, the record label gave up, and decided to publish Bruce’s original bedroom demos. Nebraska is one of the coldest and less populated states of the American States. Accordingly, the record sound is grave, hypnotic and monotonous. 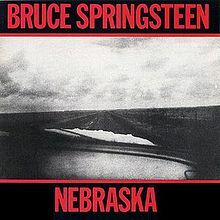 A reflection of Springsteen 1982’s own introspections possibly, and a signpost for the political tones given by the characters that populate this disturbing record.